Industrial brass will accent your statement with a BOLD exclamation! These heavy-duty babies are one of our best sellers! 10mm in diameter, these imperfect, grungy pieces are high quality, heavy metal. They are mounted on pure titanium posts, the pad is surgical stainless steel and the ear nut is plastic, so everything is hypo allergenic! We are passionate about hypo allergenic because our owner has ears just as sensitive as you! There is nothing worse than to find a CUTE pair of earrings that make your ears itch and burn! We hope these give you NO issues! This pair is heavy weight and not too bad on the ears, but we wouldn’t recommend wear for more than 8 hours. They are incredibly durable, double checked for strength and made with extra love! They are sure to get your lobes noticed! Try them on today and let us know what you think! Leave a review, share a pic and tag us on social media! 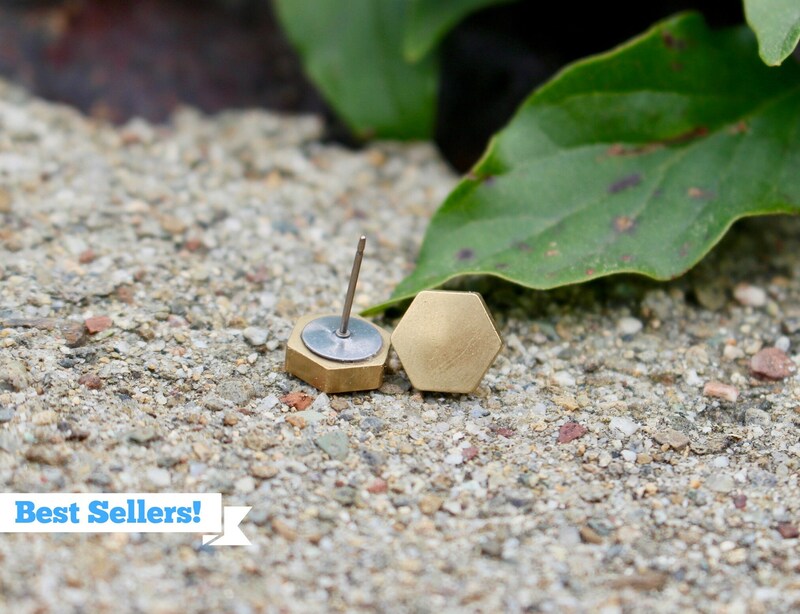 I wanted a pair of gold hexagon earrings to replace the pair I lost. These are better than what I had! Perfect size, they have a nice weight to them, and cleanly made. And she sent an extra gift along with what I purchased! So happy with them! Thank you!! They were a little heavy, but so stinkin' cute! cute! somewhat heavy, but i like that i know they’re there!